The chill mists of late autumn clung to the hillside, and they obscured the waters of the Drifting River which wound slowly through the poplar and spruce woods at the foot of the rise. The stillness of the late afternoon country air was unbroken save for the barking of Bimbo, a small wiry farm dog of indistinct origin. A face, worn and lined by life, appeared to rise and float momentarily above the mist. As the fog dispersed the face was seen to belong to a stooped, almost elfin-like figure which was slowly ascending the hill. Source: Dauphin Herald, 4 September 1984, page 13. The form, as it approached, was perceived to be clothed in an ancient hand-knit toque and a carefully patched jacket long since discarded by a former family member. The sleeves were turned back, lessening their superfluous length on the frail arms of the wearer. Under the jacket, and encasing the lower half of the body, was a skirt fashioned from an old leather jacket, the sleeves of which had been removed and the armholes carefully sewn together. What had been the neck of the old jacket encircled the tiny waist of the wearer. When buttoned down the front it formed a sturdy protective outer layer against the cold and the spillage from two galvanized tin buckets of river water which were being carried in the mittened hands of the bearer. Bimbo leapt and circled protectively as the figure, somewhat frightened by the appearance of a stranger in the remote secluded farmyard, paused shyly and placed the buckets on the ground. 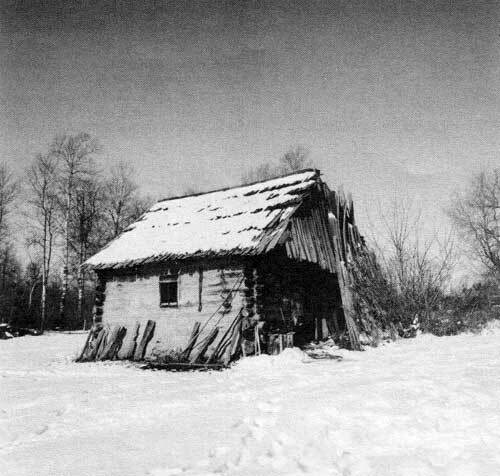 The 1899 Negrych log house. Constructed in traditional Ukrainian style, it has handsome doors that are wide and low. Vertical boards line the gable ends of the roof. The brick chimney and the shingles are not original. On arrival, they built a temporary shelter of poplar poles placed in the shape of a tipi and covered with a cowhide they had purchased in Dauphin. Their main house was built in 1899; it is still standing and has been lived in continuously. In this home five more children were born to Wasyl and Anna. Of a total of twelve children, only William, Stephen and Annie survive. William is in a personal care home in Dauphin; Stephen and Annie still live in the original log home that their father built. Neither Stephen nor Annie has married. 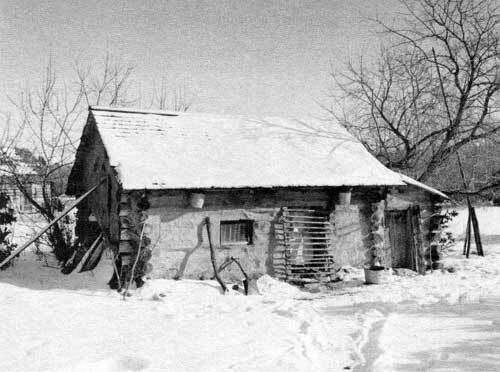 Their home, bunkhouse, barn, granaries and surrounding buildings were all built from materials found at hand. No skilled labour was employed. 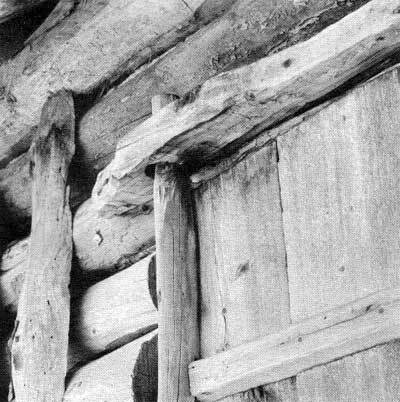 With the exception of three windows and some nails which Wasyl carried from on his back, no purchased materials were used. 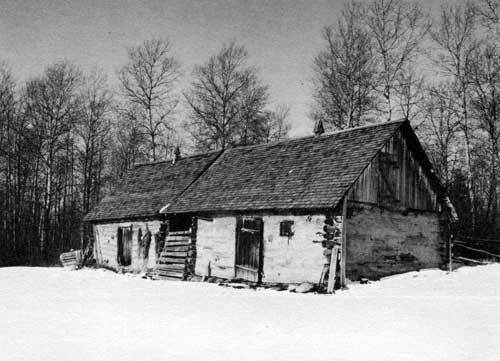 All of the buildings were built of round logs made from either spruce or tamarack trees, with saddle and notch cornering. The house was finished, inside and out, with handmade plaster to which laundry bluing had been added to give brilliance. Except for some patching over the years the interior and exterior finishes are of the original clay, straw and animal dung plaster commonly used by Ukrainian pioneer builders. Opposite end of bed-sitting room with highly polished wood burning heater. The door, which leads into the kitchen, is handmade from wide wooden planks. The beamed interior is in excellent condition. 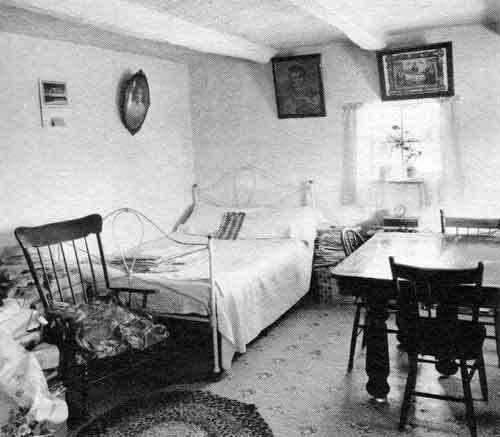 The main room is a bed-sitting room which contains two iron beds, a rocking chair, extension dining room table, a treadle sewing machine, a small box heater and a coal oil lamp. The East wall of a Ukrainian house is traditionally the holy wall. Hung here are three religious pictures which belonged to Wasyl and Anna and which have, for eighty-six years, been kept in their original positions. The central small room is the kitchen. It contains an iron cook stove with two oven doors which open from the side, some handmade shelves and a washstand, a rain barrel containing their water supply and a small work table. The house has no running water, hydro, sink or washing machine. Everything is neat and orderly. Hand braided mats cover the floor. The warmth from the two wood burning stoves exudes comfort and peace. It is the house in which both Stephen and Annie were born. They have not sought to change it by adding modern conveniences but have chosen instead to maintain it as their parents originally built it. Not far from the main house is a small building which still serves as Steve’s sleeping quarters. Built as a bunkhouse for him and his three brothers, it has a floor which consists only of impacted clay. 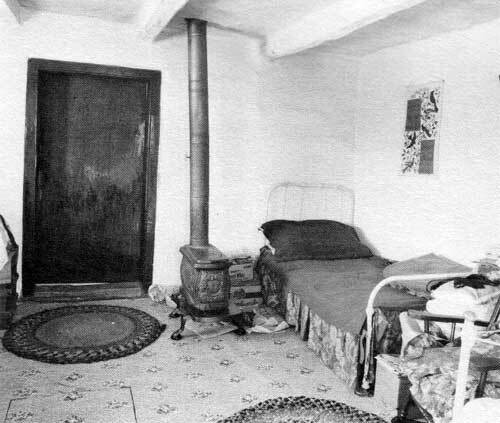 It contains two handmade wooden beds and the original clay oven or peech with which it is heated. The peech was built by placing a log framework on a stone foundation. Rising above this framework at the front or open end are four vertical poles which are connected to the ceiling and strengthened by horizontal bars at regular intervals. Over these bars are hung bunches of hay rolled in damp clay. When these had dried, several outer layers of clay were applied to the over-all structure giving a smooth exterior and interior surface. Near the top of the section of the peech which was joined to the ceiling a clay vent or pipe is constructed at right angles through the wall to vent the smoke into a porch which had no ceiling. From there the smoke escapes through hand hewn cedar shakes on the roof. There is no chimney. Houses with-out chimneys were traditional in many parts of the Ukrainian highlands. The focal point of the kitchen is one of the earliest iron cook stove models. Polished and maintained in pristine condition, it has oven doors which are hinged at the side. Shelves and cupboards are the original ones built in 1899. Bunkhouse. Built as a combination bunkhouse and summer cookhouse, it is still inhabited. Constructed in the traditional fashion of the Kolomya hill district in the Ukraine, it has a cedar shake roof with no chimney. Bunkhouse interior. On the floor of impacted clay, worn work boots rest beneath a handsome bed. Exterior of bunkhouse door is covered with corrugated cardboard for insulation. The knob and pin which secure it are handcrafted. This is the only example on the prairie of a peech in a building which is still inhabited. Normally, because of their size they were destroyed to make room for iron cook stoves once these became available. On the inside corner of the quarter section adjoining the one with Stephen’s and Annie’s buildings, there is a vacant log house built by Stephen’s uncle. It is reached by a short walk through a black spruce forest. It contains the most amazing and historically valuable item of the Negrych architecturea massive hand-made peech still in working condition. Built in traditional Ukrainian fashion the top of it, which was flat rather than rounded as the outdoor ovens were, extended from the back of the upright chimney to the outer wall of the house. The clay in this flat area of the oven retained heat from the fire throughout the night. Here, in the winter months, the babies and the elderly were customarily placed to sleep. 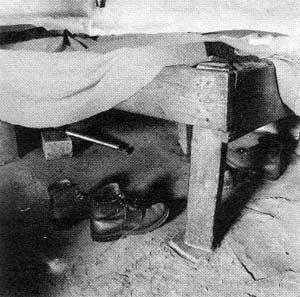 This area of the Negrych peech was spacious enough to sleep three. As well as the huge peech the room also contains all the utensils for tending it. These are a hoe-shaped instrument or kotsuba used for removing the coals from the oven before putting in the bread, a peel or flat paddle used for putting the bread in and taking it out of the oven, a small wooden stool or stolets, which holds a wooden trough in which to knead the bread, and a brush made from wheat straw wedged into a slit stick, used for cleaning up ashes and soot. 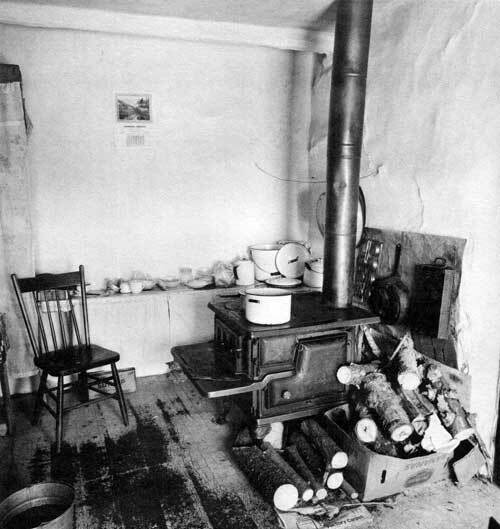 The wide bench surrounding the stove was used for sitting on or for keeping food warm. Above the stove near the ceiling is a pole used for hanging clothes to dry. Again the smoke from the peech is vented into the attic. Barn featuring slatted door. The barn was built in two sections under one roof, with a central passageway. 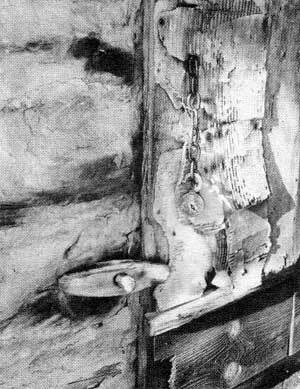 The slatted door allowed air, but not animals, into this open space. The log barn in Stephen’s and Annie’s farmyard has a central passage for storage and unloading hay or grain. Its roof has handmade ventilators. 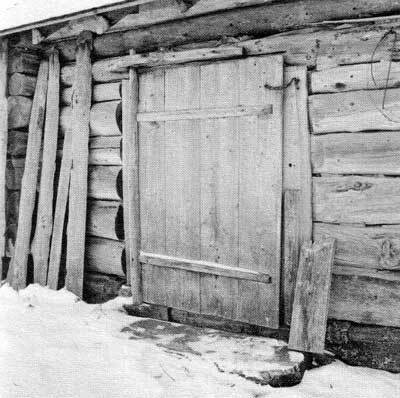 The barn and granaries have doors which, built in the traditional Ukrainian fashion, have no hinges. The doors are suspended from upright poles which pivot in holes bored into the supporting crossbars. Their construction is uniquely simple and employs no metal parts. Over many decades of use the doors have not sagged. Stephen Negrych, a retired school teacher and a graduate of Wesley College in Winnipeg, taught up to sixty-seven pupils at a time in one-roomed rural schools on the prairie. In all his years of teaching he did not miss a day of work nor was he ever late. After retirement he returned to the farm to assist his brother William and his only remaining sister Annie to continue farming. William became ill and as, mentioned, had to be placed in a personal care home in Dauphin. In the fall of 1984 a huge auction sale, which employed three auctioneers, was held to dispose of the machinery, animals and artifacts of the Negrych family. Hand woven baskets, bread mixing pans hewn from tree trunks, handmade tools, wooden churns and all the necessities of pioneer life which had been retained on the farm buildings for over eighty years were sold to collectors and to museums. Now only the main house, bunkhouse and chicken house are occupied or used. Stephen and Annie continue to live in quiet simplicity. 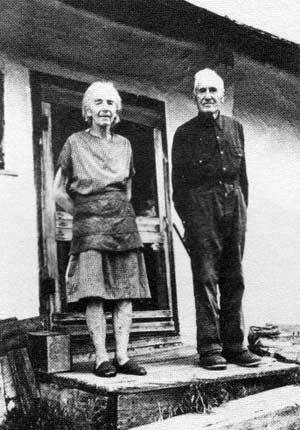 Annie cooks on her tiny wood stove, keeps house, irons with her mother’s sad-irons, washes and cleans with water which is carried by hand from the Drifting River as it has been for eighty-six years. Stephen cuts wood and gathers twigs for kindling from a nearby black spruce wood which has been preserved in the centre of the section of Negrych land. Here also, in the winter stillness of what he fondly calls his “park,” he feeds the jays, whiskey jacks, and white tailed deer, all of which come daily to eat the grain and bales of hay he provides for them. In the long winter evenings the brother and sister read by the light of coal oil lamp. Sometimes Stephen plays his violin. Annie patches and mends clothing maintaining the thriftiness of early pioneer times in her daily apparel. The lines of time disappear from her face, her blue eyes sparkle again as she tells of her childhood and the joy she feels in caring for her brother and their tiny home. Although Stephen speaks of retiring to Dauphin, Annie tenaciously clings to the only home which she has ever knownthe one in which she was born and in which her parents and her sister died. 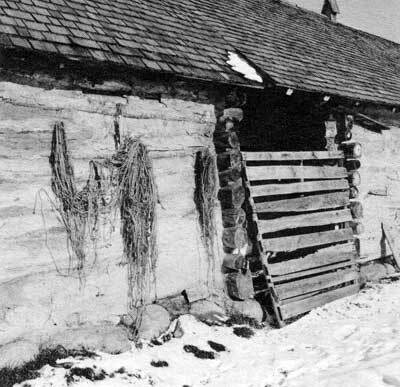 The Negrych buildings, maintained in their original condition, are true examples of prairie vernacular architecture. 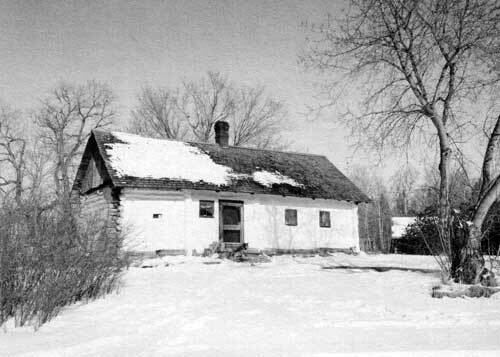 It is to be hoped that, when Stephen and Annie are no longer able to maintain them, the buildings will be purchased and moved to the new Selo Amphitheatre and Historic Site on the northern slope of Riding Mountainthere to be preserved as a very integral part of Manitoba’s ethnic architectural heritage. 1. Dmytro Romanchych, “Ukrainski kolonii v okruz; Dauphin, Manitoba” Ukrainian Colonies in the Dauphin, Manitoba, District,” in Memorial Book of The Ukrainian National Home Association in Winnipeg, 1949, pages 511-512. 2. M. Ewanchuk, Pioneer Profiles: Ukrainian Settlers in Manitoba (Steinbach: Derksen Printers, 1981), page 98. 3. M. Ewanchuk, personal interview, February 1986.